Part of the luxury of doing what I do is that I can down to the basement and pull out a giant bound volume of Life magazine from a long wall's worth of Life magazines and browse/graze away--a much easier thing to do with the volume in hand than it is to do online at the Life site. (Let me tell you that there is simply no comparison, and that you retain far more leafing through the volumes than scrolling down the monitor--try it out at the library next time.) For this particular volume--part of 1942--there was a growing realization that there was an awful lot of the color red being used in the advertisements, as though it had just been "discovered". And there was a lot of it being used to sell candy, cigarettes and, of course, meat. This ad for Camel cigs is one with a minimal amount of red, though the use of it seems judicious and expansive to the major points of the message. Odd that the idea of "taste" appears almost as a secondary item of attention, and that the thrust of the copy is that lots of doctors happen to smoke Camel, without mentioning why. Well, the ad implies smoothness of smoke to the throat and the "T" section, for taste and easy impact on the throat, but the overwhelming message to me seems to be the smoking doctors giving an Rx to the cigarette. 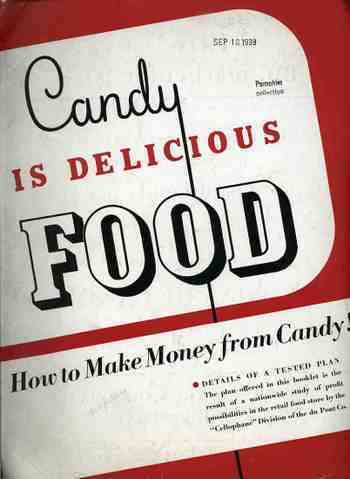 On the other end of the attack to the human body was the notion that candy=food, an interesting way of moving a heart-busting luxury product, all wrapped in red outlining a white heart, evoking Valentine's Day and love, though this was love for candy itself, as the ad appeared in June. The Meat Team--not a particular type pf meat; just meat, a red advertisement putting the "eat" in "meat". Red was also used for SPAM, which is a very democratic type of meat byproduct. Another boost to candy as a food. I'm probably all wrong on this, but that was the sense-impression I got from leafing through six inches of Life magazine for 1942. Samuel Clemens (1835-1910), who became Mark Twain in 1863 and then mostly stayed that way, had a great mind and was a superb writer and story teller--he wasn't necessarily a great inventor, however. In the ear;y sea of his great achievements, in 1871--just after the publication of his first real best-seller, Innocents Abroad, 1869)--Clemens applied for and was granted a patent for a bra clasp. I don't know if it is the bra clasp, or not, but for whatever reason Clemens pursued this interest all the way to the end. In the year after the publication of Roughing It, and three years before the publication of The Adventures of Tom Sawyer, Clemens patented--essentially--a blank book. It was a special book/holder for the very-popular practice of scrap booking, and it seems rather ironic that someone who filled up so many books with words would get a patent for the sale of books that didn't have any. Curious. But I was distracted by the idea of seeing something in a different context, of associating something with a sense experience far beyond its origin, and so the History of Lines will wait just a little--something just a little beyond seeing some electrical function of the brain inscribed as a long line on a skinny piece of paper. What I found was this--the invention of Mr. E. Hardy, whose "Formenephone" detected the presence of combustible fire-damp or any other gas in mines, and which would then emit sounds on the accompanying (small) organ pipe. The apparatus would actually vibrate more rapidly as the gas content of the air increased. At the time (the notice of the invention appearing in the Scientific American Supplement #945 for 10 February 1894) the only other means of detecting these gases was by the change of the glow of a candle. Perhaps this is in a way like the application of musical notes to the numbers pi or tau, though actually useful. I'll return to the History of Lines tomorrow. Formene, or marsh gas, is a "hydrocarbon which produces chloroform when the hydrogen in it is replaced with chlorine, loses hydrogen and yields anthracene". If each of the 2,000 trucks pictured below carried $100,000,000 dollars in hundred dollar bills, how many trucks would it take to carry away the national debt? Every one of them--this entire scene. 70 times. Twenty miles of this convey, each truck carrying $100,000,000, would carrying off the debt. Actually it would take 40 trucks (each with 100 million) to cart away the amount of debt accrued in daily interest on the national debt of 14 trillion dollars. This Life magazine ad for the Chrysler Corporation--makers of Dodge--took the form of a public service announcement and a push to buy more ear bonds, though it really was an advertisement for itself and its wartime efforts. What it proposed to graphically portray were the 300,000 trucks that it manufactured (to that point) for the U.S. Army--and the image that they use to get the point across is arresting, but it doesn't come close to doing the job. It seems to me that the visible trucks here number about 2000 for the five columns; and I calculate that each of what we can see of the columns to be about 1500 feet long. In order to show 300,000 trucks we'd need to show this page 150 times; or what Chrysler is showing is 1/150th of their total wartime production of trucks. To show them all would take a lot of time for the two-star to review, hours, in fact. I reckon that the five-column-wide display for the 300k trucks would be about 150 miles long. So even though this image is very persuasive and impressive, it doesn't come close to the magnitude of the number's display. 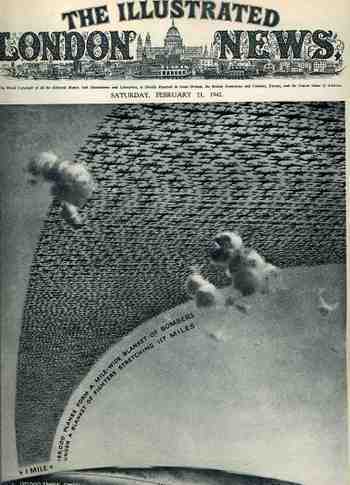 This arresting cover image for The Illustrated London News of 21 February 1942 illustrates the (new) American production program for planes and tanks for 1942 and 1943 The caption reads: "185,000 planes form a mile-wide blanket of bombers under a blanket of fighters stretching 117 miles" which is actually a double blanket of planes--if they were thinned out to form one layer it would stretch one mile wide from Washington D.C. to New York City, which is quite an unimaginable ribbon. The numbers and depiction are in some aspects similar, though it is still very difficult to get the point across of how massive these numbers really are. 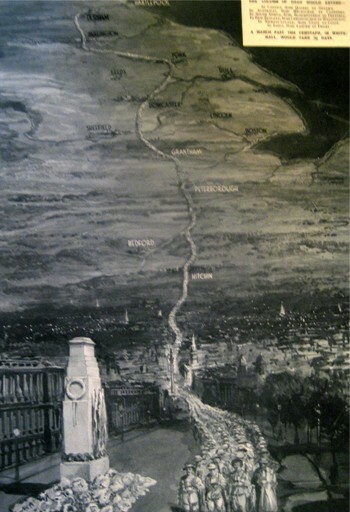 The image (printed in 1933) shows the column stretching from London to Durham--London through Hitchin, through Bedford and Peterborough and Grantham, past Sheffield and Leeds and York, and then on to Durham--a distance of 269 miles or so. Four across, a 269-mile column of dead soldiers. That makes a pretty big point on an extraordinary sacrifice. So the short end of the story is that back there during 1944, the Chrysler Corporation somehow managed to vastly underplay their war effort in an advertisement to themselves. JF Ptak Science Books Post 1528 Part of this blog's Blank, Empty & Missing Things series. What is the opposite of "the Devil is in the details", without getting too terribly religious? Expressing detail in the history of art has been a progressive process, and perhaps in some sense that is what art was all about--adding detail, becoming more representational, more life-like, more expressive of the world and nature. Perhaps that is what one essential element of art was all about for hundreds, or thousands, of years--a progression that marched its way through time with greater effectiveness and representation, for the most part, until relatively recently, when--in the early part of the 20th century--details began to disappear, until in some cases there were no details at all. Or at least the details that people had been comfortable with for so long, like folds in dresses, or lustre in eyes, or thinness in clouds, or even the correct perspective in the re-invention of three-dimensional representation. Detail changed with the Romantics, and then definitely with the Impressionists, and then on into the the Cubists and the Abstract, until the detail of what we would recognize as elemental objects would disappear altogether. Corot, Cezanne, Gauguin, Whistler, Seurat, Van Gogh, Picasso, Braque, Duchamp. And then everything goes away with Kandinsky. 1911. Details of references to the physical world slipping away into general sense impressions. It would probably make more sense to look at the Kandinsky at this point--I'd rather look at the Pierre Bonnard (1867-1947) and his La petite blanchisseuse (Roger-Marx 42, also known as the Small Washerwoman). The wide expanse of her black working gown is a primary link to solid blankness, without detail of nearly any sort, missing parts of reality, allowed to go to Disappeared Detail Heaven. The occupants of the Heaven was begun centuries ago, though the details banned there on purpose really only begins in earnest with the missing details of the solids in (Paolo)1 Uccello. This great master (dissed terribly by Bernard Berenson I don't know why) was one of the very few exceptions of artists who purposefully banned details from his work, just as the reality of the world crept deeper into the works of the late Siennese masters pointing out the details of their rediscovery of perspective. 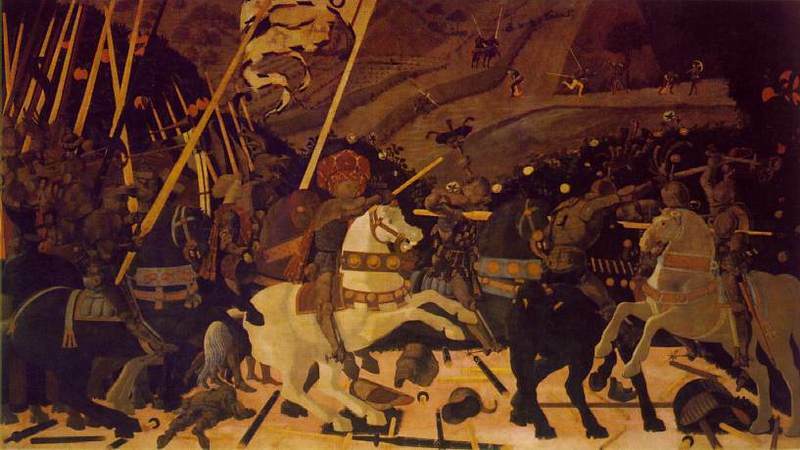 There would be a long period in between Uccello and the other detail disappearers. H-Bomb Wipes out Brooklyn. And Chicago. And New York. I stumbled on this bombing of Brooklyn article at the excellent Conelrad website--it is an excellent addition to my slight collection of vintage depictions of American cities being nuked. As part of the necessary scare tactics in the pursuit of the arms end of MAD, the destructive power of these weapons were shown against a background that Americans could readily understand. Thinking of atomic and then nuclear holocaust in terms of multiple units of Hiroshimas and Nagasakis was one thing--showing the effects of these weapons on an American grid was something else. This next graphic shows the difference in destructive capacity of an atomic bomb (small circle beneath an air-burst detonation) and a hydrogen bomb (the large circle showing area of total destruction, which in this case would be about 50 square miles) on the city of Chicago. The next image is much like the preceding, only showing a profile of Manhattan and the difference between the explosions of a Hiroshima bomb and a hydrogen bomb (of 20 megatons). And as usual, the point is made with one weapon being detonated, rather than the x-number that would actually be deployed. Depicting, say, 10 weapons being used against these cities--while being a more accurate portrayal of what nuclear war might look like--might have looked like something beyond the usefulness of propaganda. I've written here before on the wonderful book by Jan Bondeson, Buried Alive, the Terrifying History of our Most Primal Fear 1(Norton, 2001) and on the difficulties of determining death in the 19th century, and the various ways that people sought to deal with and sidestep the possibilities of premature burial. In continuing those posts I'd like to add the following drawings from hopeful reports of the U.S. Patent Office, some of which really didn't make that much applicable sense, but, well, you can patent just about anything if it hasn't already been patented. These coffins were constructed to allow their occupants to ring or telephone or telegraph or signal with smoke or light and so on should the dead respond to their lost life while buried. As I point ou tin the earlier (linked) post, determining death was a difficult task in the 19th century, so there wsa a legitimate fear-of-being-buried-alive concern. OF course, the best way yo determine death would be to allow the supposed-dead to lay out for three days at the end of which the body became a corpse and putrefy--the decay part was the true determiner of death. WHy people had to bury the dead into a coffin and be placed underground faster than the three days is a mystery, particularly if there were so many people who lived in fear of waking up in an underground coffin. And so to the solutions, the first of which was brought to the world by Franz Vester of beautiful Newark, New Jersey. Well, Newark was probably beautiful when this patent was granted in 1868, and maybe this idea seemed so, too. Here's what would happen if a dead body awoke in Vester's safety coffin: their hands were attached to a rope that would be connected to a top-side bell, and the not-deceased would tug on it for all they were worth. After that, a sliding door above the face would be moved, and the coffin's occupant was then supposed to pull themselves up to a short laddered tunnel that was connecting the living world from the sleep-of-worms-world. Were there problems? Yes, of course, but so far as it has been recorded no person ever saved themselves suing this coffin, in spite of Vester's very strenuous exercises to promote his invention. A few years later from just downthe road in Hoboken, Theodore Schroeder and Hermann Wuest were granted a patent for another rope-activated sounding device. The 1871 patent revealed what was pretty much a common thread to come--rope, hands, bell. Theoretically, if the dead awoke they would tear away at the bell until the prefect or whomever arrived to dig them out. The pair from Hoboken added a few tweaks here and there--one that allowed a release of fresh air into the coffin, and another which used an electromagnetic deice to replace the hand engine. I'm not sure how long someone can last in a coffin underground, but it can't be very long at all. Why someone would think that adding an air vent to a coffin where the dead have been underground for a few days already doesn't seem to make much sense, except to the coffin manufacturers. The next example comes from the beautifully-named Albert Fearnaught, who although not from mid-Jersey patented a device again using a rope around the wrist of the dead, this time though the rope was attached to a spring-loaded device that would release a flag when activated from below. This next (1885) patent has a slight variant on the rope-hand solution: the string-finger. Well, there was also some electromagnetic stuff involved, but basically the string on the finger of a moving not-dead-corpse would activate an electric bell and yadda yadda yadda people would come to help and release. The added extra here, the clear-coat undercoating, is a device that would allow the folks topside to peer down and see the face of the interred, and whether or not it was animated, I guess. Hubert Deveau evidently had grown tired of all of these hand/finger-operated back- from-the-dead resurrection devices, and constructed (in his patent of 1894) a relatively simple groundskeeper-alerting-breathing-device combo--a pipe that could be moved up by the head of the person int he coffin which would in turn activate a spring-something that would keep the pipe poking-up above the ground. It would deliver fresh air to the buried, and would evidently be a warning sign to the cemetery man that something was afoot, underfoot. Funny thing her is that most of the systems I looked at for this post involved a single device to release the prematurely-buried--it seems to me that there should have been at least one back-up system in case the main apparatus failed. I mean, if you're going to become intensely psychotic, why would you then depend on one thing to get you out of your buried coffin? And that one thing is, basically, a rope. What if the thing failed? I'm just saying that I expected to see a little more comfort juice applied to these solutions than I saw. 1. A fine article on patent remedies for premature burial can be found here: "Signals from the Grave, Early Patents for Detecting Life in Buried Persons", by Richard Van Vleck, in American Artifacts, issue 45, July 1999. Some things that seem perfectly odd seem to take on another life, an extra life, when you put moveable things on it. For example, coffins that have anything "retractable" seems a little much. As corpse receptacles, coffins as a box seem, I guess, an odd thing--scooping out a body's innards and replacing them with packing, toxic preservative, gums, paint, glue, plastic, rubber, wire, pins, needles and such seem to be a little on the extreme side, especially when you are going to put that body into a hole in the ground and cover it with dirt. What better thing than to enclose the corpse in a container so that the horrible idea will be further kept from deterioration? Then there's the container for the coffin, and the slumber vault cement liner, and so on. This weirdness turns professional (to paraphrase the Good Doctor) when movable/retractable bits are added to the coffin. In a long "is this really necessary?" list, one of the last/first would concern retractable legs on a coffin, or perhaps the retractable flower vases, or the inflatable puffy shirt. There's a strange sociological history going on in the thousands of death/corpse/funeral-related reports from the U.S. Patent Office, which will make it much easier for the anthropologists of the future to understand our present concerns with death, or life. JF Ptak Science Books Quick Post Part of the History of Goodbye series. "Please don't, it will leave a mark"-- on corpses, from Evelyn Waugh's The Loved One. In the vast history of humans and their disposing of the dead, of the great rituals and spectacular belief systems pertaining to the body and the non-corporeal bits and flavorings within, there is probably not much at all dealing with the creation of screw coffins with duckies on top. Such is the very recent idea of this painful looking piece of business: slide the body in, stand the screw coffin upright, and then by motive force either human or mechanical screw the thing into the Ea rth. This is all done for the theoretical modesty of economical land usage. And I guess this would make sense, even more so, than putting a corpse in a very expensive box, a corpse that has been treated so that it will decay very slowly over long periods of time, stuck in a box that is made to further prevent decay, and then place the whole thing (horizontally) into the ground, where no one will ever see it again. It seems like such a great effort to undertake to simply hide a body under a thousand pounds of dirt, when the corpse might as well not even be there. SO I guess if it makes sense to observe this practice, you might as well take up less ground. The logistics might be a problem--after all, you'll need a casket for the coffin to transport the thing from the church or wherever to The Place of Last Repose, as I don't very well imagine the look of the torpedo screw in the confines of some holy relic or draped-up maudlin-eseum. I mean, the thing would look repulsive. I'm not sure why these coffins are placed in a swamp, or why one of the statuettes is a fish. As I said, perhaps when it comes to burying people, looking at the practice under a macroscope, it is all the same. It does, however, seem as though it is dramatic evermore with each turn of the screw. It also looks pretty difficult to do. Sometimes bad ideas aren't really so until they are very, very big--and then put in water. These are some examples of what was probably a propaganda campaign on a disturbing, Twilight Zone-y invitation to imagination of a French invasion of England at about the time of Napoleon. Napoleon I. England had been invaded before, but not by the wily Corsican. The first apparatus of war was a monumental thing, and was displayed for the world in this engraving, printed ca. 1798-1801. An exact representation of a raft, and its apparatus, as invented by the French for their proposed invasion of England, printed in London by J. Atkin, portrayed the monster: 2500' x 1800', with a enormous stone fortification that seems to have been about 500x500', the thing was powered by four water turbines driven by 550'-tall windmills, it was supposed to be capable of supporting 500 36- and 48-pounder canon, plus 50,000 troops. It looks like it was built for calm water. This next beast wasn't quite so beastly as the first beast, a beast to the monster. This was the St. Malo seacraft, a thing designed in 1791 that was supposed to be 600x33 feet, supporting the same 500 canon as above, and would transport 15,000 troops. The added feature here--in addition to the windmill-driven engines, was a bomb-proof central structure, which I guess held the troops in safety as the ship was bombarded from the shore. This satirical print shows a French invasion force making its way to England above and below the channel--there are attack balloons as well as a considerable atta-Chunnel. The truth of the matter is probably closer to the images below than they were to the massive attack-islands that are pictured above. In the epochal year of 1859 (Darwin's Origin of Species is published) Philip P. Carpenter (1819-1877) contributed a very interesting article to The Canadian Naturalist and Geologist and the Proceedings of the Natural History Society of Montreal (the full article appearing here). Among many things, the intriguing title "On the Value of Human Life in Different Parts of Canada" suggests something that might seem a translucent to the modern reader--that in the statistics, somewhere, is a Bell curve that might establish what the "average" person was. The idea of the "average man"--a statistical impossibility at the time--was important in the sociological application of the statistical work of the early and very influential mathematician Adolphe Quetelet (1796-1874, fl. 1840's), whose theorizing underneath his numbers was questionable and wincing, but Mr. Carpenter really doesn't approach this--he has a much more current and applicable idea in mind. He was interested in the positive and major consequences of relatively minor government investment in the health of the population and the upkeep of the basic infrastructure of a city. In collecting his data on birth/death/mortality rates in some major cities in Canada, Mr. Carpenter undertakes a cost-benefit analysis (of sorts) to show how much it would cost to prevent a certain percentage of those deaths, and that a very small investment in maintaining a city's infrastructure would wind up saving lives and money as a result. It is an elegant, interesting argument. He points to some statistics for the city of Munchen, establishing that the sewering and cleaning of 20 street there reduced the mortality rate from 31 to 25 per 1000 ("that is, preventing 21 deaths and 588 cases of sickness in seven months"), saving the community the cost of caring for the ill and reducing the amount of time lost in the workplace. This was a very satisfying read, and the author made a simple, solid and convincing economic case for "doing the right thing". It would turn out later in the 1860's and 1870's that Carpenter's statistical methods were deeeply flawed, leading to him being abandoned by the association that he helped to create--a bitter pill, to be sure, since the overall conclusions about public health were correct, if not the numbers. After all was said and done, Carpenter was out to save people (particularly the poor), more so than an actuarial table. When Worlds Collide wasn't so much about another world colliding with the Earth--it was another star, a "rogue star", that enters the solar system and heads directly towards the Earth. Luckily for a selected few, a billionaire astronomer sees the thing coming and decides to construct a spaceship to populate a friendly "planet" near Alpha Centauri. Oh well, its 1933, and perhaps anything was possible--after all, the Empire State Building (which is depicted in so many of these movie posters in a not-good way) was just finished in 1931, after two years of construction (!). So the following are movie posters for the 1951 film version of the 1933 book--except for the first image, which is from the book. This is a continuation of a series of posts in the Strange Things in the Sky Department. 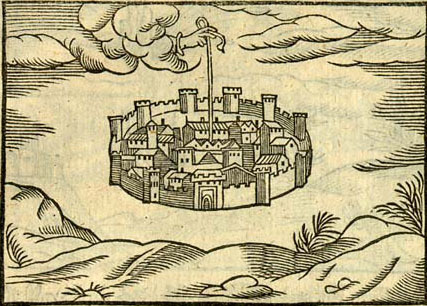 Here's a semi-famous illustration that appeared earlier in this blog--perfect here to offset the older "floating cities". This one depicts a floating or hovering or anti-gravity-something installation of a future Manhattan, existing peacefully above its former Earth-bound base, now overgrown with nature. 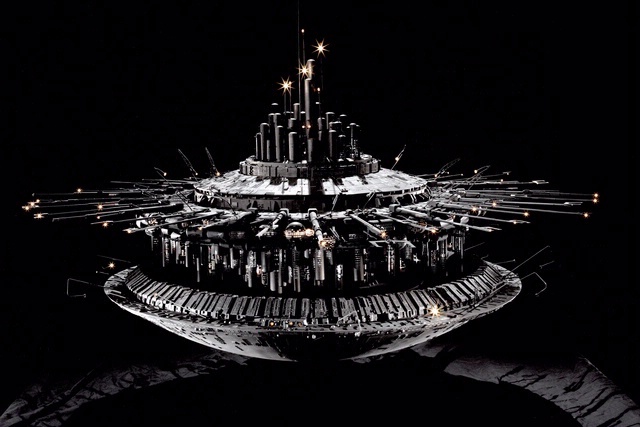 The New Manhattan Air Island is many square miles of buildings, and reminds me of the mothership from Close Encounters of the Third Kind. 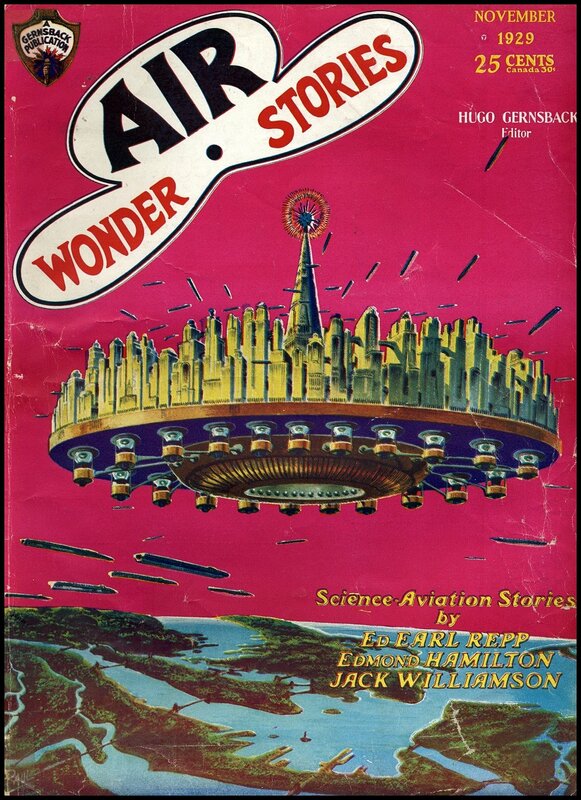 This image from yet another ubiquitous Gernsback publication and shows (another!) floating airpad/port for whatever sort of hovering vehicle that approaches. Interestingly there are a number of skydivers using unisuitwhich probably seems pretty attractive to skydivers today. Also the roof decorations are unexpected! George and Archie: Two Misty Names in Making Everything Into Nothing. Hiroshima, 1945. The names of Col. Paul Tibbets and the Enola Gay are instantly recognizable, instantly placeable in the history of the twentieth century. Fact is though that Tibbets didn't pilot his (well, Capt. Robert A. Lewis')1 B-29 all the way to Hiroshima and back, and wasn't at the controls when the bomb was released. Tibbets (also known as "Old Bull") shared some of the tactically flawless mission with his co-pilot Capt. Lewis, and also with George. Well, its actually "George", the personified names for the autopilot of the aircraft, and I guess on the long road to splitting the atom it doesn't matter much who did what at the final moments, especially if you were on the ground in Hiroshima. It was Tibbets who flew the Enola Gay most of the way, through perfect skies, nothing to stand in the way of the aircraft and the completed mission--no Japanese fighter aircraft to haunt and hunt, and no anti-aircraft coming from the ground, at least not at their low altitude.2 "George" was at the controls at 0815 on 6 August 1945--Tibbets would take control of the plane as the bomb fell away3, ripping the plane into a steep bank in trying to put as much distance between the aircraft and the bomb in the 43 or so seconds that they had before the explosion. Everything else about the bomb and the mission at the moment of release was controlled by a human--except for the flying of the aircraft. " "Archie"4 is the other name not so much remembered on this morning. This was the name given to the apparatus (there were actually four of them on the bomb) that would initiate the final arming sequence for the MK1 bomb, "Little Boy", one of a component of a fusing system that triggers the firing system. It was a nicer handle I guess than its official name, which was AP-13. 1. Lewis was the original pilot of the aircraft until Tibbets was chosen to lead the mission against Hiroshima. Tibbetts was named on 5 August and acted very quickly to get a painter to paint a name on the fuselage of B-29 82--so quickly that the guy who painted Tibbets' mother's name on the plane had to be pulled out of a baseball game to do the job. When Lewis saw it, saw his plane with "Enola Gay" on it, he reacted badly, as he was mighty pissed. He confronted Tibbets about it, but the Colonel informed the Captain that there was nothing to discuss. 2. Intelligence reported that the only antiaircraft resistance that could be expected were from heavier guns, which also happen to be very ineffective at the low altitude at which the Enola Gay flew. This also benefited another aspect of the flight plan, which was fuel consumption--coming in low meant a big fuel savings, which in this case was very important because of the enormous load that the aircraft was hauling. 3. The Enola Gay would climb at last to 31,000 feet to release the bomb, which exploded at about 1980 feet above the ground. 4. An interesting document from General Groves sums up the Archies nicely: "Memorandum dated 24 August 1944 to Major General L. R. Groves from R. N. Brode, subject: Personnel with Radar Experience. According to the latter, the APS-13 was originally called the "Charlie" and those units to be adapted to atomic bombs were to be rigged to operate at selectable frequencies between 250 and 500 megahertz. By 1 January 1945, the "Archies," with a "natural" range of 405 to 435 MHz, could be tuned between 325 and 485 MHz. ("Interim Report Archie Frequency Range," Lt. Leo Gross, 1 January 1945)--The History of U.S. Electronic Warfare, by Alfred Price, Association of Old Crows, Alexandria, Virginia, 1984, p. 232." "By the spring of 1944, the APS-13 "tail warning device" was under study for use as a radar fuse. Originally designed to warn a pilot of another aircraft approaching the rear of his plane, the "Archie" had an effective range of about 2,000 to 2,500 feet." Source: The Swords of Armageddon: U.S. Nuclear Weapons Development since 1945, Chuck Hansen, September 4, 1995, vol. VIII, pp. 3-45. "Four "Archies" were used on each bomb, with a network of relays so that when any two of the units signaled, stored current was sent into the detonators (one on the MK I and 32 on the MK III). The antennas for the "Archies" were attached to the sides of the bomb casings. "A barometric pressure-sensing switch closed when the bomb passed 7,000 feet; the bombs were dropped from altitudes between 31,000 and 32,000 feet. A bank of clock-operated timer switches, started by arming wires pulled out when the bomb was dropped, closed 15 seconds after release to prevent the "Archies" from being triggered, in case of baroswitch short-circuit, by radar signals reflected from the delivery aircraft. "The arming and firing sequence for the first two atomic bombs was (1) 15 seconds after release, when the weapon had fallen 3,600 feet, the timer switches closed part of the firing circuit; (2) at an altitude of 7,000 feet, the barometric switch closed another part of the firing circuit and allowed electrical current from batteries in the bomb to charge a number of capacitors and turn on the radar fuses; (3) at an altitude of about 1,800 feet, radar signals emanating from the "Archies" and reflecting from the ground completed the last part of the firing circuit and triggered the detonation signal." AS it turns out, the geology of replaced hair, of hair lost, hair forgotten, is rather sedimental. Its a surface category only, with so little underneath, so little actual "geology", that the underneath part is almost on top. The only thing that seems to have any geological depth to it in the history of toupees is the part, which in most cases doesn't even exist.